This article originally appeared in AR144. A prolific practitioner of more than 35 years and recipient of the Australian Institute of Architects’ 2015 Gold Medal, Peter Stutchbury is a textbook figure in contemporary Australian architecture. 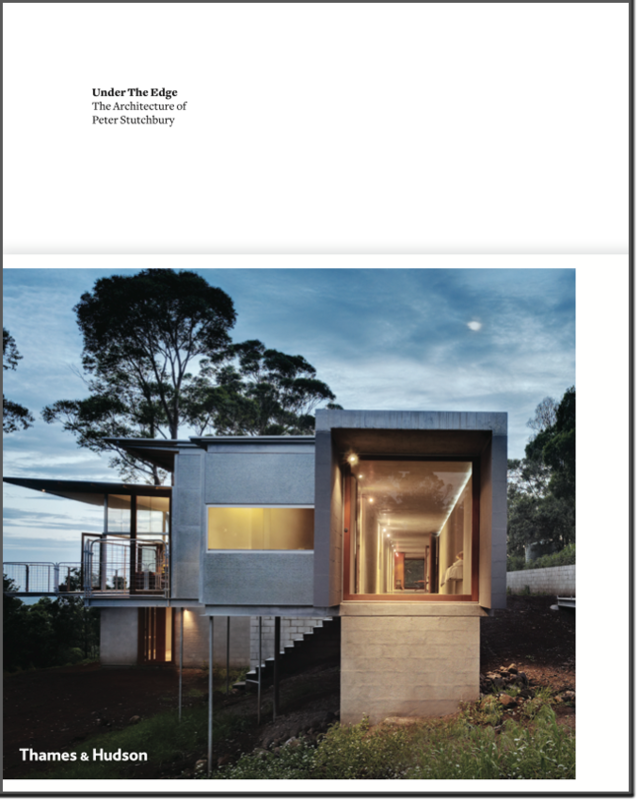 Under the Edge: The Architecture of Peter Stutchbury paints a picture of his projects through time, accompanied in this second edition by reflective essays from Stutchbury and like-minded colleagues, from Richard Leplastrier and Brit Andresen to Lindsay Johnston and Ingerid Almaas. The guest essays complement each other and establish a common architectural agenda, culminating in Stutchbury’s quietly compelling chapter, ‘Underpinnings’, which, for me, is the book’s ‘aha’ moment. Stutchbury uses simple, didactic vignettes to describe the Australian land condition and its many facets through abiding observation, memory, Indigenous precedent and personal experience. It is most telling of Stutchbury’s desire to transfer useable knowledge across generations and, without it, the book may have been lost in the burgeoning sea of insular architectural monographs. The built projects are divided into two sections. ‘Projects in Brief’ showcases single residences for which he is well-known, alongside other diverse typologies, including tertiary buildings, rural sheds, prototype structures. ‘Projects in Detail’ celebrates specific projects both local and overseas, from the humble Deepwater Woolshed in Wagga Wagga to the experiential Wall House in Shizuoka, Japan. These projects are supported by detailed documentation, even identified for specific climactic conditions: temperature, orientation, precipitation. The book closes with a ‘Project Index’, a chronological list of project portraits, and ‘Studio’, including staff portraits, both tracking the volume of PSA’s collaborators, awards and accolades over time. The works in this publication demonstrate a steady, skilled navigation of the fine line between found and founded: the land as a studied site and its subsequent architecture. One is guided by a consistent monochromatic language in the first project chapter, only to be surprised by full-colour photographs in the next: from the double-page spreads of Deepwater Woolshed to the arresting full-page view of the ocean’s edge from Outcrop House. However modest in material, there is nothing timid or tentative about Stutchbury’s buildings. 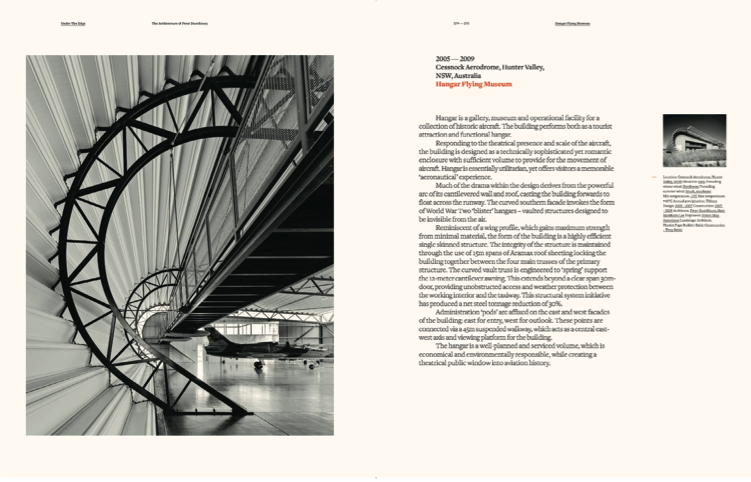 From the soaring corrugated rooflines of his University of Newcastle buildings to the confident cantilever springing from vaulted trusses at Hangar Flying Museum, the imagery asserts that environmentally responsive design does not necessitate formal restraint nor compromise in ambition. Instead of implementing discrete, externalised ESD (environmentally sustainable design) systems – a common trait of many ‘ecological’ developments – an integrated approach to sustainable technology is examined over the book’s course. Here, the environmental response and architectural gesture are one and the same, stitched into design details by the same architect, who has been known to acclimatise to his projects first by camping on-site. Loose landscape impressions precede each project, highlighting Stutchbury’s site-first sensibility. In this way the physical drawing process is also integral and positions his work as a technical art. Hand- drawn plans, sections and junction details inform the photography and foster contiguous dialogue between interior and exterior spaces. ‘Studio’ is about people and the collaborative effort behind the architecture. Full credit is given to all parties involved: builders, consultants, partner practices, current and past team members. At Stutchbury’s table, the builder’s know-how is just as valued as the engineer’s expertise; he also considers buildings equally the work of his clients. There is even a photograph of a competition design session so convivial that it could easily be mistaken for a family dining-table scene, if not for the reams of yellow trace and pens-in- hand. That the making of Stutchbury’s architecture is not a singular act by one man, but is contingent upon a coordinated chorus of supportive parts: this is what makes the selected projects sing beyond form. In all, the contents of Under the Edge have been curated with calculated brevity. Its varied documentation provides each project context and scope, arguably the next best thing to visiting each site in person. There is no florid manifesto or push for a stylistic agenda. Rather, it relays a scholarly understanding of the essential privileges that come with living on this land, lessons in reciprocity and ‘embedded knowledge’, together with the resulting moments of enjoyment and collective appreciation. Read Maitiú Ward’s review of the 1st Edition of Under the Edge: The Architecture of Peter Stutchbury.